In our never- ending quest to learn more about Quirk a query on the web revealed that his wife Anna also had some flair with the brush. 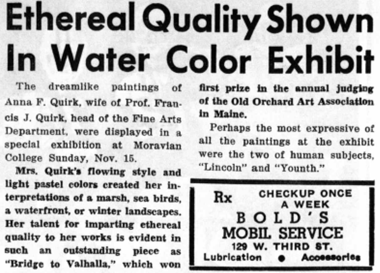 The article below was in the Lehigh University Brown and White on Tuesday November 23, 1964. It appears that Anna's work had been exhibited at Old Orchard (Beach) Art Association and it was also on view at Moravian College. According to Wikipedia "Moravian College a private liberal arts college, and the associated Moravian Theological Seminary are located in Bethlehem, Pennsylvania, United States, in the Lehigh Valley region. The College traces its founding to 1742 by Moravians, descendants of followers of the Bohemian Reformation (John Amos Comenius), the 17th century Moravian bishop, though it did not receive a charter to grant baccalaureate degrees until 1863. We have not yet found any of her works... but we have not really tried that hard yet.